Annie Always Wears Her PFD. Do You? 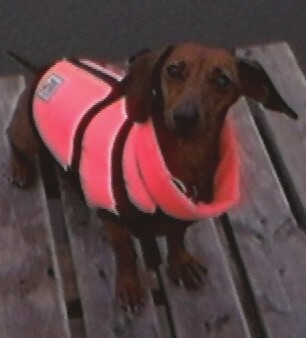 WELCOME TO ANNIE THE PFD DOG'S WEBSITE! This page was created to inform people about the importance of water and boating safety, and PFD use. It also tells the story of the "PFD Poster Dog" -Annie the PFD Dog. Annie the PFD Dog lives in MD, right by the Chesapeake Bay. This has provided plenty of opportunity for her to swim, boat, and enjoy "Life On the Chesapeake".